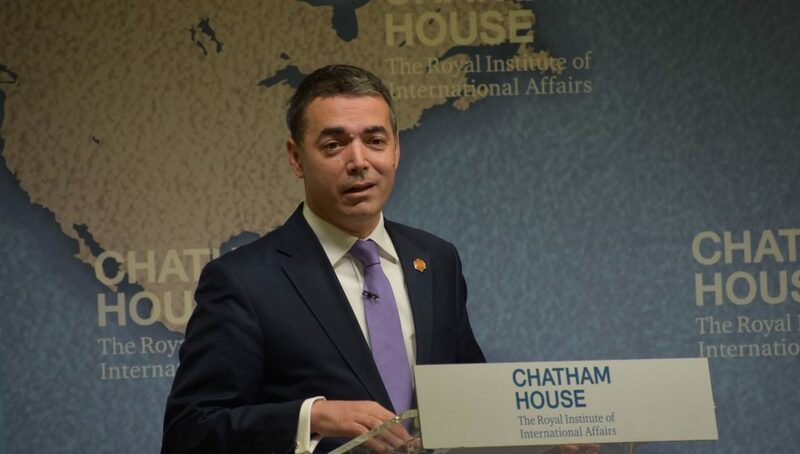 The interview with Nikola Dimitrov, Foreign Minister of Macedonia, was conducted in London after the event “Beyond Berlin: What Does the Next Decade Hold for the Western Balkans?” organized by Chatham House, European Fund for the Balkans and DG Near on 10 July, where Dimitrov was the keynote speaker. European Western Balkans: Reaching the name agreement with Greece was undoubtedly a major breakthrough for Macedonia. What made it possible for your government to conclude the deal, whereas previous governments could not solve this for more than two decades? Nikola Dimitrov: First of all, it takes two to tango. The credit goes both to Greece and Greek leadership as well as Macedonia and our leadership. Macedonia matured going through the political crises. We tried several approaches in the past to resolve the problem, but we didn’t. Blaming each other, that failed. You cannot really fight your way to break the door and join NATO and start the journey towards the EU, because joining NATO and being part of the European family means that we will be allies with our Greek neighbours. And the way to do this is through discussions, through understanding the concerns of the other, picturing ourselves in the shoes of the other, and we finally managed to find a compromise that is obviously a good compromise given the reactions it both societies. We are equally happy and equally unhappy, but the only way forward for any two neighbours is through conciliation and understanding. Further down the road, five years for now, this unlocks huge potential not only in terms of our Euro-Atlantic aspiration, but also in our bilateral cooperation with Greece. And there is nothing more natural than for our neighbours to be our biggest supporters. I think this is the biggest success that we achieved in the debate of General Affairs Council in Luxembourg before the European Council, when both Greece and Bulgaria argued so prominently in favour of Macedonia. EWB: What do you think the example of Macedonia means for the entire Western Balkans? When I say this, I primary mean the resolution of its bilateral disputes, but also democratic transformation. Do you think that what happened in Macedonia could have effect on the region? ND: It probably encourages others to face problems. I think we have spent years and decades either ignoring or not really prioritizing resolution of bilateral disputes. It’s time to step it up in our region. We are losing the fight with time. The youngsters are leaving, the problem with brain drain is all over, not only in one country, it is regional phenomenon, and the only way to tackle it is to think where do we want our countries to be 10 years from now. And if that means political self sacrifice then so be it, maybe the role of our generation of politicians and politics was to be spent on these resolutions. And I think, from that historical perspective, we will be judged positively by the people. EWB: Are you satisfied with the fact that European Council approved opening of negotiations in June next year? Is it something that you are satisfed with, or you hoped for much more than that? ND: We have essentially the path to open the accession talks in June 2019, this is what the European Council endorsed. The problem for us is that we have missed so many opportunities waiting at the station. The trains have been passing, and now our journey is more difficult and it is more uphill because enlargement is not popular, EU is burdened with their own problems – from the Eurozone to Brexit and the migration crises which is also a crisis of solidarity. So the context is now more complex and more difficult than it used to be. The accession process is more rigid, stricter and longer. So we have to face this reality and do what we can. Politics is the art of the possible. And we need to convince everyone that to make Balkans European is less costly than to ignore the positive things that are coming out of our region. EWB: What are your expectations regarding NATO accession of Macedonia? Do you think it can be done as quickly as it has been announced recently? Could Macedonia actually join NATO next year? ND: I think we will these days in Brussels on the NATO Summit receive an invitation to start accession talks. This is a technical process that could be done in a matter of months. 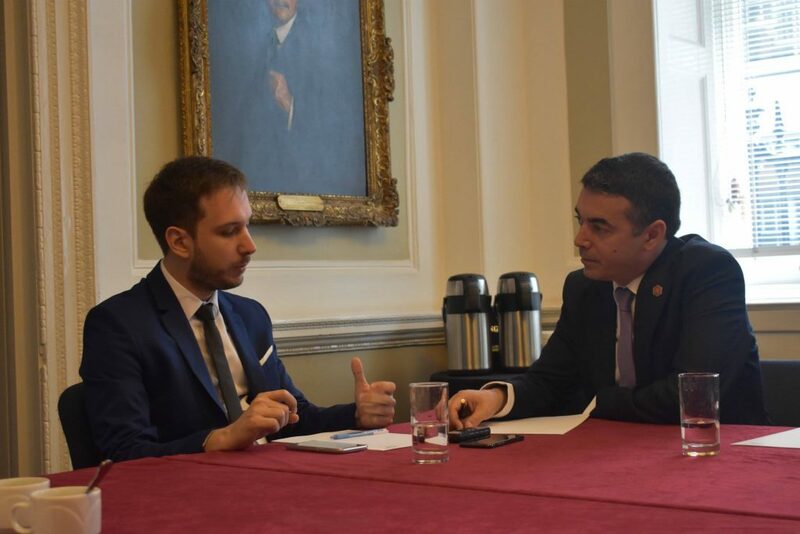 It is also related to meeting our obligations from the bilateral agreement with Greece. We have a referendum to win and constitutional process to go though. And then once this is finalized, we should be able to sign the accession protocols. Then those this will be ratified by the parliament in Athens and other member states. So if things go well it is a matter of months. Maybe mid-next year we will be formally the 30th member state of NATO. EWB: What are your expectations regarding the referendum? It seems that everything depends on the success of the referendum. ND: I am going to be very open, I think that people will support the agreement, because it covers the most sensitive part, which is who we are and what kind of language do we speak. We are Macedonians and we speak the Macedonian language. We have managed to find a way to distinguish between cultural heritage and what we mean when we say Macedonian in Macedonia and what in Greece they mean when they say Macedonia and Macedonians. In many ways it is an end of an era for Macedonians, full of challenges and question marks. The issue is turnout because the electoral roll – the list of registered voters – in not quite up to date. We have formally 1.8 millions of voters, but we probably have less citizens living in the country currently. So, this will be the challenge and it will depend a lot on the opposition and what they do with this. If they recognise the historic opportunity and the historic moment, if we all think more about the country and less about our political futures, than this should be a very successful referendum. In next few days, we have to make a big decision how do we do this. The stakes are too big and I think there is no bigger patriotic duty for any government in Macedonia than to create this opportunity, and we have done this. We will do our best to reach out to the people and have them firmly behind this agreement. It is a fight between the past and the future. We cannot really charge our past but hopefully we can shape our future. We have done this for the citizens. EWB: Was it perhaps a big gamble to opt for the universal usage of the new name of Macedonia instead of only international one, which actually puts the whole issue of referendum? ND: This was a key prerequisite for Athens to agree to have this compromise. It is not easy for them. They do less, of course – they don’t have to change anything on their side. We do more, but we also gain more. As with any compromise, if you focus on positions it becomes more difficult, if you focus on long term interests than there is a bigger space for a compromise and for a resolution. EWB: Does your government have a strategy if the referendum fails? What could that actually mean for the whole Euro-Atlantic path of Macedonia? ND: We are focused on winning it. We are going to think positive and focus on plan A. We have a Prime Minister who is fully invested in this. I don’t think it is about staying in power, that is not the key intention. We have big mission for the country. We are trying to do things that we have not done for the last 20 years in the matters of one, two or a couple of years. And this is in one way a challenge, but then we have no time to waste. The window of opportunity may close. We don’t know what kind of European elections we will have next May, what will they bring, what kind of institutions we are going to have in Brussels and what will that mean for the Balkans. That is why there is a sense of urgency to do this now and push this through in the following months. EWB: Many were shocked when some EU member states, first of all France and Netherlands, were actually poised to prevent Macedonia from opening negotiations, even after all the reforms and advancement in resolution of bilateral disputes. At the end there was this kind of compromise to open negotiations next year. What kind of messages this sends to you government? Are you concerned about this kind of perspective of European integration for the whole region? ND: All of us together in the Balkans need to convince them that our place is in the EU, that we deserve it. For us, the ultimate goal is not to join EU per se, but to make our countries European. And the more we do it, and the more persistent we are, the less difficult is going to be for them to embrace us. We live in a complex environment – the world is not very certain, Europe is burdened with its problems. Politics is the art of the possible. In an ideal world, we should have had a clean cut decision to start accession talks this year, maybe in December. But at the same time, in difficult circumstances and in difficult political calculations we have a big window for June 2019 and we intend to seize it.